In sport, people usually like to root for the underdog, especially when that underdog is in direct competition with an established superpower for a major prize. In the 2000/01 Bundesliga season, Schalke 04 became the second favourite club of everyone in Germany apart from supporters of Bayern Munich, their title rivals, and Borussia Dortmund, their sworn enemies from the Ruhr. That season, Bayern’s bid for a third consecutive Bundesliga title faced stiff competition from Schalke, who had won the league six times during the 1930s and 1940s but only once in the preceding 59 years. When the club from Gelsenkirchen defeated ‘FC Hollywood,’ the disparaging name given to Bayern by begrudging football followers in Germany, at the Olympiastadion in Munich towards the end of the season, it looked as if Schalke’s big moment would finally come. They had won the UEFA Cup four years previously, but a Bundesliga triumph to dethrone Bayern would have surpassed that. However, with just three games to go, Schalke surprisingly drew with Bochum and then lost to Stuttgart, allowing Bayern to take a three-point lead going into the final day of the season. The reigning champions were away to Hamburg in their last match while Schalke, in their final game at the Parkstadion before moving to the modern Arena AufSchalke that summer, were at home to relegation-threatened Unterhaching. While Huub Stevens’ side would have been confident of winning their game, the chances of Bayern losing to a Hamburg team with no tangible incentive were rather slim. Saturday 19 May 2001 did not promise to be an especially dramatic day in Bundesliga history, but it would go on to become arguably its most iconic of all time. The possibility of last-day drama looked even more remote just three minutes into the game at the Parkstadion when Andre Breitenreiter, who would have a spell as Schalke manager many years later, put Unterhaching 1-0 up. A pin-drop silence descended around the stadium; even by Schalke’s standards, this was threatening to turn into a bottle job of unbearable proportions, all the more so when a Dortmund goal temporarily elevated their Ruhr rivals into second place. If the table finished that way, Schalke would have then been dispatched to the Champions League qualifiers, as only the top two finishers went directly into the group stage. Despite this unexpected good news for Bayern, who would be playing in the Champions League final four days later, Ottmar Hitzfeld’s team looked nervous against Hamburg, whose fans were volubly encouraging their team, fervently hoping to be the ones that denied Bayern the title at the final hurdle. Neither their mood, nor those in the blue of Schalke, would be improved in the 27th minute when Unterhaching had the temerity to double their lead at the Parkstadion. Scores elsewhere would mean that a win for Unterhaching still wouldn’t spare them from relegation, so it was the Bayern fans who cheered that goal the loudest. Schalke snuck back up to second when Koln equalised against Dortmund and their supporters raised a further cheer just before half-time when Nico van Kerckhoven pulled a goal back. In first-half stoppage time, a cheeky backheeled goal from Gerald Asamoah drew Schalke level, and now the home faithful found their voice. News of the quickfire double was enthusiastically greeted at the Volksparkstadion by Hamburg supporters and, while both title chasers were drawing at half-time, Schalke had momentum while Bayern were looking jittery. Could the miracle somehow transpire? On 59 minutes in Hamburg, Carsten Jancker had the ball in the home side’s net but the goal was flagged for what appeared a tight offside call, much to the fury of the bald-headed striker. Bayern’s travelling support seemed undeterred, with chants of ‘final’ suggesting that their attention was already turning to the Champions League showpiece against Valencia in Milan. Things got even better for the Bavarians 10 minutes later when Martin Cizek restored Unterhaching’s lead against Schalke. With Stevens’ team now needing two goals, as well as a favour from Hamburg, and only 20 minutes remaining, the race appeared all but over. In a substitution laced with sentiment and desperation, Schalke legend Olaf Thon was sprung from the bench for his first game in eight months after a season-ruining injury. Just as they had scored twice in as many minutes at the end of the first half, Schalke would do so again in the 73rd and 74th minute. Jorg Bohme was the scorer of both to turn the game on its head and give Die Königsblauen a 4-3 lead. When that news reached Hamburg, the home fans cranked up the volume, knowing that one goal for their team would deny Bayern the title in extraordinary fashion. A few minutes later, Thon found the net but the goal was incorrectly ruled out for offside. Schalke would soon make it 5-3 through Ebbe Sand, the league’s top scorer that season, and now they knew that at least they would get the win they needed. Unless Hamburg could pull a last-gasp winner out of the bag, though, the Bundesliga title was staying in Munich. When the game in Hamburg entered stoppage time, Marek Heinz whipped in a cross towards Sergej Barbarez, who directed the ball past Oliver Kahn to put the home side deservedly ahead. Astonishingly, the miracle which looked so forlorn less than 20 minutes previously was now about to materialise. At that moment, Schalke were top of the Bundesliga on goal difference. Their players on the pitch in Gelsenkirchen raised their arms in celebrations even though their match had not yet ended. Back in Hamburg, Kahn instantly grabbed the ball from his net, ran to the centre circle to place it for the restart and ordered his team-mates to try and find an equaliser. When Samuel Kuffour squandered a glorious chance to get it from the restart, Bayern fans must have been thinking they were going to throw it all away as spectacularly as they had done in the 1999 Champions League final against Manchester United. The final whistle blew at the Parkstadion and, even though the match in Hamburg was still in progress, Schalke players and fans exploded in celebration. Players and club staff embraced each other so gleefully that it almost looked like they were indulging in a full-blown wrestling match. Thousands of supporters streamed onto the pitch. This grand old stadium would get the greatest of send-offs. 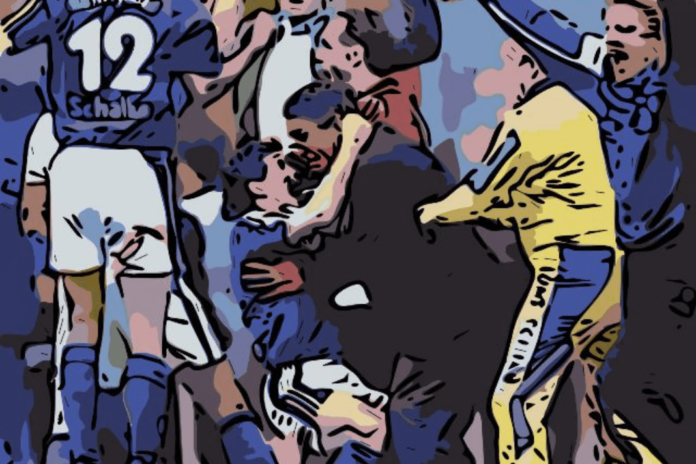 Had social media existed at the time, you could envisage myriad tweets, posts and snaps toasting a long-awaited, and highly unlikely, Bundesliga triumph for Schalke 04. In the dying seconds in Hamburg, the home side’s goalkeeper Matthias Schober carelessly picked up a backpass from Tomas Ujfalusi and referee Markus Merk gave an indirect free kick inside the penalty area. Bayern’s Stefan Effenberg and Patrick Andersson conversed at length while every single Hamburg player took up position on the goalline. Effenberg applied the faintest touch on the ball to leave it to Andersson, who crashed it beyond 11 Hamburg players and into the net. The ecstatic scenes which were playing out in Gelsenkirchen were now being replicated by Bayern’s players, fans and staff. The charismatic Kahn made a beeline for the nearest corner flag, ripped it out of its holder and waved it aloft. The subsequent full-time whistle confirmed Bayern Munich as champions and Hamburg’s supporters booed their visitors loudly. When word of Andersson’s goal reached Schalke’s fans at the Parkstadion, many dismissed it as some attention seeker spreading fake news before their worst fears were officially confirmed. The Bundesliga title would not be theirs after all. For four jubilant, unforgettable minutes, they were champions of Germany. Now, their euphoria had turned to shock and despair. To miss out on the title after failing to win their two previous games was tough enough. To miss out after this most amazing of comebacks, after the footballing gods finally seemed to have done them the ultimate favour, only to retract it almost immediately, was beyond sadistically cruel. Tears of joy soon turned to tears of utter anguish. In the 17 Bundesliga seasons that have been completed since 2000/01, Schalke have finished second on four further occasions while Bayern have won another 11 league titles, including each of the last six. The club from Gelsenkirchen may have won the German Cup in 2001, but that year will forever be regretted by their loyal, passionate supporters for being the one in which they were champions for four minutes. Schalke 04 were given a taste of what it was like to win the Bundesliga, but had been horribly deprived of the genuine article. The wait for that first league title since 1958 continues.